Zulfikar Hirji is Associate Professor at York University, Toronto. His research focuses on the diverse social and cultural expressions of Muslims in historical and contemporary contexts. He has conducted archival and field-based research in the Middle East, East Africa, South Asia, Europe, and North America. His publications include The Ismailis : An Illustrated History (2008), Diversity and Pluralism in Muslim Contexts (2010), Between Empires (2012), and Islam : An Illustrated Journey (2018). Covering a period from the eighteenth century to the early twenty-first century, this multidisciplinary volume examines Muslim engagements with the Qur’an in a variety of geographical locations in sub-Saharan Africa including Burkina Faso, Kenya, Mali, Niger, Nigeria, Senegal, and Tanzania. The volume’s twelve case studies use different frameworks and methodological approaches from the academic disciplines of philology, historiography, anthropology, and art history. These studies explore a variety of media and modalities that Muslims in sub-Saharan Africa, as elsewhere, use in their engagements with the Qur’an. These include : manuscripts ; commentaries ; translations ; recitations and invocations ; music and poetry ; magical squares and symbolic repertoire ; medicinal and curative acts ; textiles, ink, paper, and wooden boards ; spaces of education, healing and prayer, as well as spaces of dreams and spirit worlds. As such, the case studies move well beyond the materiality of the Qur’an as a physical book to explore the ways in which the Qur’an is understood, felt and imagined, as well as the contestations and debates that arise from these diverse engagements. Approaches to the Qur’an in Sub-Saharan Africa opens up new discourses about Islam and Muslims in sub-Saharan Africa through the examination of how Muslims in this geographical and socio-cultural context engage with the Qur’an, and about the Qur’an through an examination of how Muslims in sub-Saharan Africa engage with it. 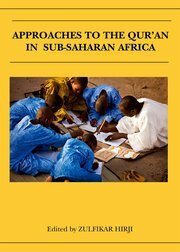 Thus, in seeking to understand the plurality of engagements that Muslims from diverse communities of interpretation and from different parts of sub-Saharan Africa have had with Qur’an, this innovative collection adds to the scholarship on the Qur’an as well as the scholarship on Islam and Muslims in Africa.